Outdoor adventure starts at The St. Regis Aspen Resort. We're located at the base of Aspen Mountain, a short walk from the shops and restaurants of this historic town. Enjoy complimentary transportation to and from the Aspen-Pitkin County Airport four miles away. Take in panoramic views of the Rocky Mountains from our heated outdoor pool or three year-round hot tubs. Pamper yourself with luxury services at Rem de Spa, named best hotel spa in the world. Sample mountain food at Velvet Buck or sip hand-crafted cocktails at Mountain Social. Experience elegant dining at Chefs Club, currently welcoming New York's Eleven Madison Park for EMP Winter House in partnership with American Express. Our dedicated concierge service caters to every detail of your outdoor terrace wedding. Luxury accommodations include leather beds, pillowtop mattress and marble bathrooms, plus our St. Regis Butler Service stands ready to assist you 24 hours a day. Whatever the season, enjoy the rustic elegance of The St. Regis Aspen Resort. The Velvet Buck: The Velvet Buck celebrates those who settled this region in the 1800s with an emphasis on local ingredients and primal cooking techniques. Enjoy modern mountain cuisine amidst the rustic elegance of this restaurant. Open for breakfast, lunch and dinner. Mountain Social Bar & Lounge: Our Aspen restaurant is your destination for Apres Ski, live music, lite fare and drinks after the slopes, offering tribute to the elegant Lake St. Regis wilderness which inspired founder John Jacob Astor IV to open his first Central Park hotel in 1904. 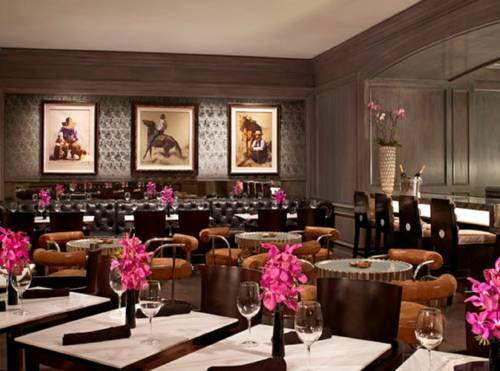 Chefs Club by Food & Wine: This chic eatery hosts a rotating lineup of award-winning chefs.